The spherical drive profile means that it is possible to swivel the axis of the tool to that of the screw. The Torx ball end tip enables angled "around-the-corner" screwdriving. This ball end tip geometry - often found on L-keys is now avaiable on a number of Wera bits. The 05059703001 Wera 867/4 KK Ball End 1/4'' Power Drive Torx Bit is one of thousands of quality tooling products available from MRO Tools. Please browse Wera 1/4'' Torx Power Drive Bits for tools similar to the 05059703001 Wera 867/4 KK Ball End 1/4'' Power Drive Torx Bit. 05059703001 Wera 867/4 KK Ball End 1/4'' Power Drive Torx Bit description summary: Wera 867/4 KK Ball End 1/4'' Power Drive Torx Bit. 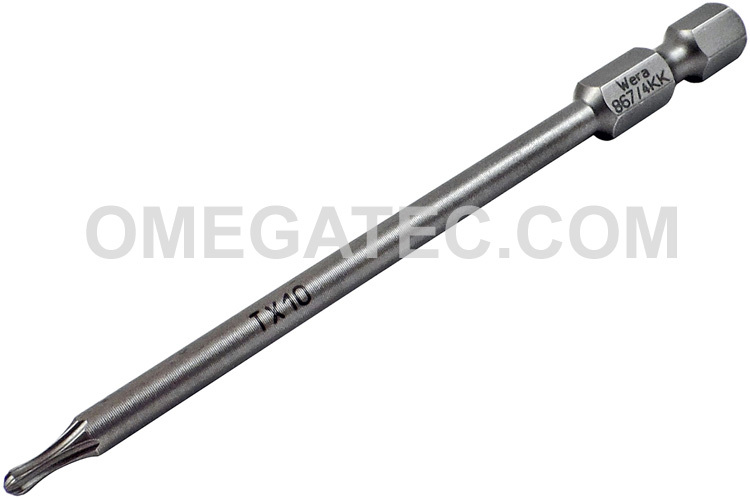 Point Size: TX 25 Overall Length: 89mm / 3 1/2'' Quantity discounts may be available for the 05059703001 Wera 867/4 KK Ball End 1/4'' Power Drive Torx Bit. Please contact MRO Tools for details.